As you glance at the colorful photo above, you are beholding a phenomenal Bahamian culture-lifter and undisputed king of Goombay, the Hon. John Arthur Chipman, belovedly known throughout Bahama-land as "Chippie". Countless men half this lively septuarian's age only dream of having his vast cultural energy, vibrant ancestral spirit, and sharp business acumen. Chippie has well earned the title king of goombay as through his contributions, the art of goombay drum making has advanced to a higher level. The first goombay drums were made from discarded barrels and rum casks, but as the decades passed these items came to be in short supply. Chippie's ingenious mind prompted him to begin making goatskin drums from large metal cans, also adding a sterno to them so that the skins could easily be heated for a superior sound. A skilled artist who has performed across the world and received numerous honors, Chippie, a youthful-looking septuarian, has taught scores of drummers the art of drummaking. So when you see the hundreds of powerful Junka drummers of all ages rhythm-rocking up Bay Street during the heart and heat of Junkanoo, the facility of that sound has been stimulated to a large degree by the contributions of this indefatigable, positive elder. 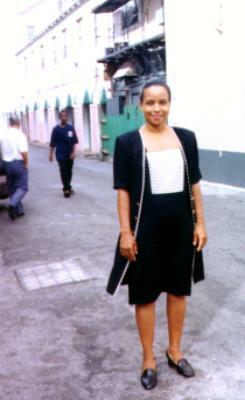 Due to his fine beautySpirit and willingness to serve the Bahamas and the world with his immense talents, Chippie was blessed with a wonderful life partner, friend, and gifted co-artist, his late wife, Rebecca Oliver-Chipman, (�Queen Becky�). The cultural couple formed a beloved performance team as dance partners in the early years. Famed as the Queen of the Fire Dance and godmother of culture, Mrs. Chipman subsequently went on to become a pioneer female fire dancer in a male-dominated field at a time when there was great prejudice against female entertainers in the islands. Born to lift her culture, Queen Becky persevered despite these obstacles and now, even though she was called to Spirit some years ago, her presence is still loved and respected as one of the Bahamas' leading cultural pioneers. 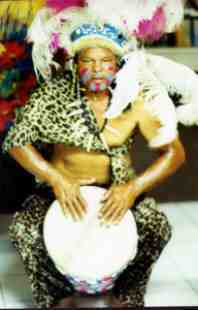 Chippie concentrated on his drum performances, earning a world-class reputation with his craft and being given the title �King of the Drums� by an inidigenous Native American group in the Netherlands. When one mentions the art of fire dance, the late Queen Becky immediately comes to mind; at the mention of goatskin drum, the staccato drumbeats and lithely dancing feet of Chippie claim one�s mental attention. Behold above once more proudly clad in the garments of his great ancestral culture, Chippie, King of the goombay drums/King of Junkanoo . The late Queen Becky, master of the fire dance, and King Chippie, master of the goombay drum. 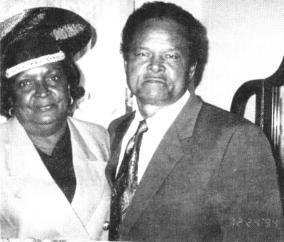 One of the Bahamas' greatest cultural couples. Poet, publisher, and fire dance artist, Donna Chipman ("Queen Donna"), one of the five lovely daughters of King Chippie and Queen Becky. Each of the Chipman children have been enterprising in their own way; most are artists like their parents and one (Sonia) is a leading real estate entrepreneur in Nassau. Donna, as one of the rare Bahamian women publishers, has documented her father's artistic contributions by penning a book based on his craft entitled How to Make A Goombay/Junkanoo Drum. Quite commendably, she is also documenting her mother's accomplishments in a video project on her career as a fire dancer. She has also authored a number of books of poetry. During Mrs. Chipman's last days when she was bravely battling a debilitating illness, Donna, along with dedicated family and friends, organized a tribute cruise to her parents. This gifted young artist is a living embodiment of the African proverb, "Children are the reward of life." May her projects be greatly successful and may Queen Becky and King Chippie remain ever a vibrant part of Bahamian cultural history. and carry their vision even higher! L'il sistuh hornblower, blow your horn of praise. This work in honor of the King of the Junkanoo Drum/the Queen of Fire Dance was born on the Web in African Heritage Month, February 6, 2000.